She battled against brain cancer and never gave up. 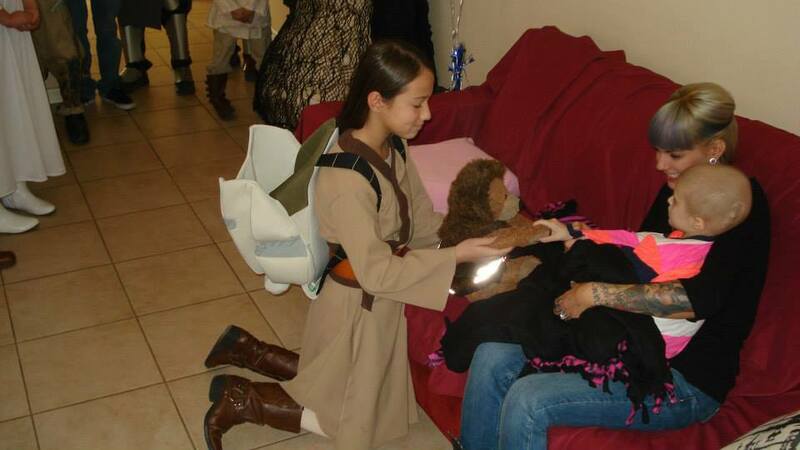 A friend of ours from the Mandalorian Mercs contacted us to join a Star Wars visit he organized for her. He wanted to get as many females to join to emphasize girl power. Together with members of The Rebel Legion we joined and visited her home. Malice Skirata had also called that anyone who couldn’t make the trip could send gifts for Shay. We showed up Mandalorians, Jedi, Princesses, Pilots, a Queen,…. and our teddy bear Chewie to offer our support. We all brought gifts for Shay and she really enjoyed meeting Victoria and our kids. Among all the Star Wars coloring books, DVDs, action figures (including a Quinlan Vos AND an Aayla Secura! ), and photos, Malice had made her a suit of Mandalorian armor. She tried the helmet on and it was magical. We were all touched by Shay and her family’s strength. They offered their thanks and her little brother Liam and Axel became fast friends. Her father Greg offered his sincere thanks to us many times to which I felt I owed him our thanks. His family inspired me that love and strength can be stronger than fear and pain. We kept in contact with the family as firm supporters of Shay’s cause and one week later just before her Make a Wish trip to swim with dolphins she went back to the hospital and was sent home where she passed surrounded by her loved ones. As crushed as we were our family stood strong and offered any and all we could to her beautiful family. Because of her strength and determination ShayStrong is her legacy. We are the ones left behind who carry it. Her parents Greg and Robin continue Shay’s non profit ShayStrong because she would have wanted it that way. As she went through her treatments and hospital visits Shay wanted nothing more than to find a cure not only for herself but so she could prevent others from going through what she did. A five year old girl enduring more than most of us do in our lifetimes searching for a way to help others. It is through adversity that our true self is revealed. Shay was one of the toughest people I’ve ever known. Thank you Shay, Greg, Robin, Liam, and Shannon for showing me the power of determination, love, and unity. My family and I treasure everything you have taught us. Thanks to everyone who supported ShayStrong including The Black Death Crew, Stryder, GotF, LotF, The Mandalorian Mercs, The Rebel Legion, and everyone else who donated or supported in any other way. This entry was posted in News and tagged Aayla, amidala, charity, chewbacca, chewie, Cosplay, Costume, Costuming, Disney Princesses, Jedi, Legion, leia, Make a Wish, Mandalorian, Mandalorian armor, Mandalorian Mercs, Mando, Mercs, padme, pilot, princess, queen, Quinlan, Rebel, Rebel Legion, Secura, Shay, ShayStrong, Star Wars, Strong, Vos, X-Wing. Bookmark the permalink.